A Russian-Italian company specializing in customizing mobile phones with precious materials hasn't overlooked the upcoming meeting of the two superpowers' leaders on the sidelines of the G20 summit, offering to celebrate the encounter with a special gadget. With nothing considered to be over the top for the Caviar atelier, the company has now prepared 3D portraits of the Russian president and his US counterpart. Depicted neck-to-neck and covered in fine gold, the two leaders are ready to be added to either classic Nokia 3310 or an iPhone7. "The fact that they're looking in one direction undoubtedly expresses everyone's desire of a progress in Russian-American relations," the company wrote on its webpage. 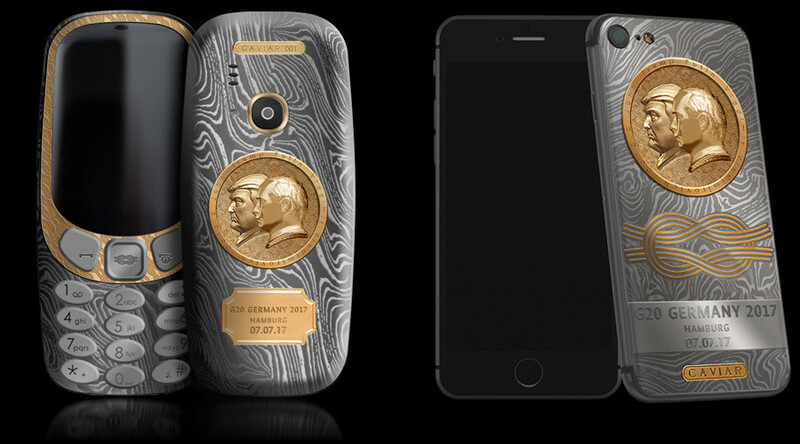 The summit's logo, as well as the date of Putin-Trump meeting – 7/7, 2017 – will also be engraved on the titanium covered gadgets. The choice of material, which is very much shockproof, is aimed to symbolize "adherence to principles and firmness necessary to stand by the country's interests." Twenty iPhones and the same number of Nokias are available for preorder in a limited edition offer, with prices starting from 149,000 rubles (around $2,500). However, for those who don't need an extra iPhone but would rather just adore their own with a golden Putin-Trump detail, there is a "special offer" of customization, which is three times cheaper.